The EU and the Civil Society. Romania Where Does It Stand? Abstract. The Treaty of Lisbon adds a new dimension to the legislative process in the European Union through what is called the Citizens’ Initiative. Trying to decrease the democratic deficit with which the European Union is confronted with, the Citizens’ Initiative implies that a mature and responsible European civil society should arise along with an European public sphere. The main question of my article is how Romania’s civil society would handle this challenge and how would it cope with the role of a partner at a European level. First of all, I would like to make a short analysis of the civil society at the European level. Second, I shall take into account the civil society as it is presented in Romania, describing how it acted during the process of integration to the European Union. Last but not least, I shall approach from a theoretical perspective this new provision in the Treaty of Lisbon, trying to answer the question whether a European civil society would decrease the democratic deficit or not. The European External Action Service – Towards a Single EU Voice? Abstract. In early 1990, the former Belgian Prime Minister Marc Eyskens metaphorically described the European Communities as „an economic giant, political dwarf and military worm”. However, the European Union’s economic power has the potential to influence the political behaviour of states and international organizations. 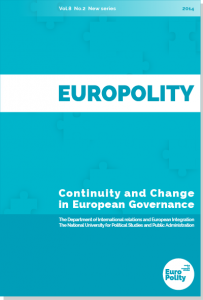 Therefore, this paper aims to investigate in which degree the new institution formed through the Treaty of Lisbon – the European External Action Service, can contribute to the transformation of European Union’s economic power in political power, and to what extent it can lead to a real increase in efficiency and consistency when it comes to the Common Foreign and Security Policy. Abstract. The European Union’s decision-making process is a debateable topic especially since the enforcement of the Lisbon Treaty, as it modifies some aspects regarding the balance of power between the European institutions and the member states. As such, an important provision of this Treaty is the improving role of the national parliaments. Therefore, my aim is to analyze the following issues: to begin with, I shall discuss the courses of action that the national parliaments could take in the European decision-making process before the Treaty of Lisbon; secondly, I shall present the new opportunities of the member states’ parliaments of getting involved in this process according to the Lisbon Treaty. And last but not least, I shall discuss the impact of the increasing role of national parliaments in Romania’s case. In other words, on the one hand, I am going to analyze whether or not there are structural changes in Romania’s Parliament, which influence its functioning both at the European level and at the national level; on the other hand, I am going to study if the implication of our country’s parliament in the European decision-making process is a more visible one, considering this new provision. Abstract. Through this paper, I intend to analyze the European Union in the post adoption of the Treaty of Lisbon era, from a realistic perspective, which would put in the foreground concrete problems faced these days by this “unidentified political object1″, with the hope that the recognition of these weaknesses will lead to solutions for the Union to emerge stronger. Regarding this, I will argue that the Lisbon Treaty was not able to provide the long awaited reform of the enlarged Union. In the first part, I will stop to the genesis and legitimacy of the Treaty, then to the institutional dynamics, and for the last part I will bring to the spotlight current events, such as: Eurozone crisis, the violation of Schengen agreement and the EU involvement in the Libyan war. Abstract. Since the establishment of the first European Community, there were some transformations within the Foreign Policy. If at the beginning the main objective was to maintain a climate of peace between member states, this evolved in order to increase the EU’s role and to transform the Union into a global player with power to influence the international decisions. In the ’70s, Henry Kissinger raised an essential question: “Who do I call if I want to call Europe?”. After more than three decades, the Lisbon Treaty, ratified on 13 December 2009, tried to answer the former U.S. secretary of state for this Foreign Policy question. Thus, through the new institutions and functions created, such as: the High Representative of the Union for Foreign Affairs and Security Policy, the European Council President or the European External Action Service, the Union is reshaping its tasks regarding the Foreign Policy, Diplomacy and Security, and the legal personality it currently enjoys is a step forward for its recognition as a leading actor on the international political arena.